RV travel means freedom. Freedom to go where you want, when you want, and for how long you want. You can make a rough plan and follow it loosely, or you can make a detailed, by-the-minute plan and keep to it. It’s all up to you. It is, however, always a good idea to have at least some idea of where you want to go, and what you want to accomplish. Oh, and you should probably plan out a budget so you know how much you’ll be able to spend as you go. Our Cruise America travel experts will help you pick out the right unit for you, depending on the size of your party and to where you will be traveling. This popular driving route traverses through close to five hundred miles of oh, so mountainous Appalachia. During the summer months travelers can experience some heavy traffic in certain areas, but the incredible scenery is more than worth the wait. Route 66 is the consummate American road trip. Many are the movies, novels and music numbers that feature this famous stretch of highway … and it certainly does stretch … all the way from Southern California to Illinois! For a diverse experience that includes both natural wonders and historic sites, take your rental RV on a tour of New England. It has a lot to offer RVers looking for a change. Over the last five years, New Orleans has experienced an incredible revival. The route through the Gulf Coast region isn’t one of the more common RV routes, but it makes for an excellent roadtrip in your rental RV. Prices have become manageable because of the tourism business experiencing a slowdown in recent years. Yellowstone National Park is one of the world’s most visited RVing destinations, and is definitely worth a trip to Montana to see. It’s probably the most intriguing camping you’ll ever experience. Try to take advantage of the many scenic routes as you make your way to Yellowstone. Do your best to plan a scenic route that passes through other points of interest in the Rocky Mountain region, such as Rocky Mountain National Park and Grand Teton National Park. For a spectacular midwest adventure, and using Chicago as a base, make a circuitous route along the American side of the Great Lakes, through the Upper Michigan peninsula. If you do end up planning a trip like this, be sure to take along any water-sports equipment you may have, like surfboards or paddleboards, as there are an abundance of beaches on this route. The American Southwest is still the type of landscape worth exploring in your Cruise America rental RV. Though the region contains famous parks like the Grand Canyon National Park and Zion National Park. There are also some great urban areas of the Southwest, such as Santa Fe, New Mexico, which is known for its pueblo-style Native American architecture and a beautiful collection of arts. Traveling along the Southeastern coast of the United States is not unlike a New England RV trip, as the jaw dropping landscapes and the bustling urban areas create memories that will last a lifetime. As you travel, be sure to stay along the coastline, from Virginia down through the Carolinas, then on to Savannah with its southern charm, history and culture. This route makes for an excellent RV journey through the Pacific Northwest. 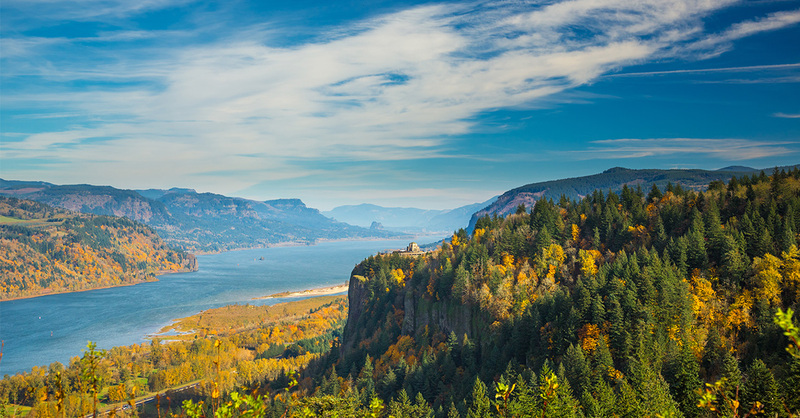 You could start in Portland, Oregon, and make your way along the majestic Columbia River Gorge. As you travel, you will find all sorts of quality RV parks, as well as scenic points you’ll not want to miss. If you’re a fan of the ocean (and who isn’t? ), the Big Sur Coastal Highway provides an ocean experience as you travel along the central coast of California, Every quaint little seatown along the route is unique, yet so similar. Don’t miss the opportunity to explore each of these little towns, with their singular qualities and adventures. These are just a few examples of trips you can enjoy with your family in your Cruise America rental RV. You will find that no matter where you roam, the journey is always just as enjoyable as arriving!